So how should a corporate sponsor go about sniffing out a cause marketing partner? There are several… oftentimes opposing… schools of thought on the subject. One is that you should pick causes that have some sort of link to your business. For instance, a food business should pick a food charity. Why? So that your customers prospects don’t have to spend too much cognitive energy figuring out what the link is between the two organizations. Because customers just won’t do it. If it doesn’t make sense, they’re not going to pull out their phones to Google the question ‘Why does Acme Axel Manufacturing Company sponsor bone cancer research?’ Instead, it will seem like 'cause-nitive dissonance' and they’ll just ignore it. The opposing view holds that customers see such links as cynical. In this view, a Consumer Packaged Goods that makes canned spaghetti sauce and links up with a network food bank network during the Christmas season is plainly just playing on their customer's emotions. Certainly there are plenty of sponsors who really don’t care that much about the cause. They find a charity that can fill their requirements for a one-time promotion and move along to another cause after that. In my view, there’s nothing terribly wrong with that so long as both parties know going into the relationship that it’s a hook-up and not a partnership. But the ideal would be to only link with causes for which the sponsor has some kind of special passion, affection, or zeal. Because their customers could sense the genuineness and authenticity of the company’s commitment. These thoughts occurred to me after reading a press release about a UK waste management company called Waste King that recently gave 30 percent of one day’s profit to the UK charity Medical Detection Dogs. That's one of their dogs on the left. Medical Detection Dogs are dogs that are trained to sense and alert their owners to medical conditions like low-blood sugar, diabetes, narcolepsy, seizures and, perhaps, even cancer. 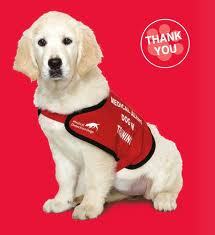 The cause of Medical Detection Dogs strikes me as being very marketable. Indeed, Leslie Nicol, who plays Mrs. Patmore on the hit TV series Downton Abbey, has just signed on as one of the charity’s ambassadors. But it nonetheless seems like a rather random choice for a waste management company. In other words, Waste King’s donation could be an example of any of the above. It could be a cynical link-up driven by the appeal of the cause and the celebrity. It could that one or more people and Waste King had a genuine commitment to Medical Detection Dogs based on personal experience. Or it could be just a head-scratcher of a cause marketing campaign that crop up from time to time. A small hint is provided by a quote in the press release. “We’ve wanted to do something to help Medical Detection Dogs for some time – and we’re pleased that we’ve now found a practical and effective way to do so,” he added. Here’s the take-home lesson: If your company has an odd choice for a charity partner and if there are specific reasons for your commitment, you should take pains to explain where that commitment comes from in the press release, on your website and in any other media where you activate your sponsorship.